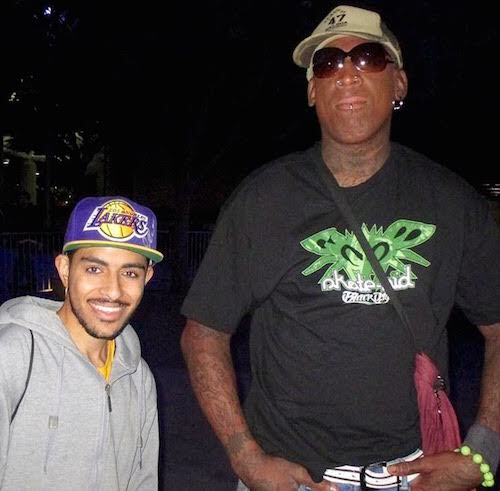 Reader Shaan Khilnani also provides iFolloSports.com with a photo of he and the incomparable Dennis Rodman. These days, the 54-year-old Rodman finds his way into the news mostly for his association with North Korean leader Kim Jong-un, as well as his stints on reality television programming. As a result, many folks have forgotten what a consequential basketball player he was. Rodman played 14 NBA seasons, winning a title in 5 of those campaigns. The hall of famer was an integral member of the Pistons back-to-back championship run in 1989 and 1990. He would later play a central role in the Bulls 1996-1998 Three-peat, which included playing for Chicago’s 1996 record-breaking 72-win team. Rodman’s résumé features 7 rebounding titles, 7 all-defensive first team selections and 2 All-Star appearances. The 6’7 forward averaged 15 or greater rebounds in 7 of his 14 seasons.